When you need a fixture to brighten the room’s style, as well as shed light, it’s time for a reproduction Greene and Greene fixture made of mahogany or Port Orford cedar. 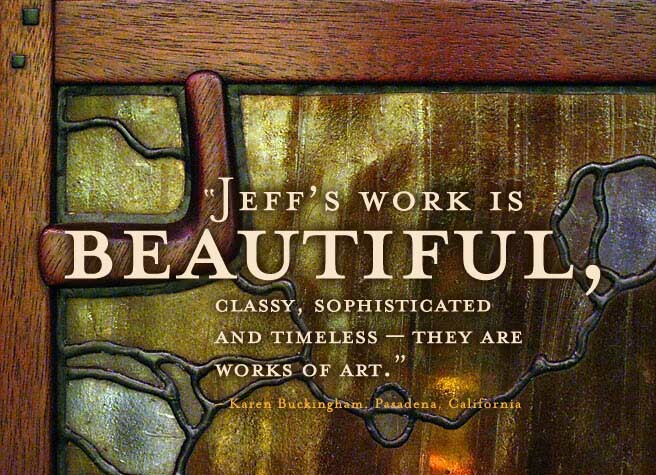 Jeff Grainger Studios combines hand-carved piercing and metal details with colorful stained-glass shades on wall sconces and lanterns for indoor or outdoor use. These fixtures add a delicate touch to a child’s or guest room or make a grand statement in a formal dining or living room. Jeff also designs table and floor lamps that give an Arts and Crafts home its warm, golden glow; and entries and hallways a focal point as you transition from room to room. See the reproduction lighting fixtures Jeff has created in the style of the Robinson House, Gamble House and Blacker House in Pasadena, California. These designs, or your custom look, can be created for your dining and living rooms, kitchen and bedroom, or patio and entry hall. Most fixtures accommodate multiple bulbs to control the amount of light and all provide easy access to change bulbs. To finish the project, Jeff installs each fixture to ensure a seamless fit. He’ll start designing your custom Arts and Crafts and Greene and Greene-style lighting to create beautiful objects for your home.